Introducing Competition JVTeam will develop and deploy a new, streamlined registry-registrar protocol: the extensible registry protocol (XRP). The XRP provides more features and functionality than the existing registry/registrar interface, and far greater security. The benefits to the Internet community are greatly improved Internet stability and increased public confidence. JVTeam will work with the Internet Engineering Task Force (IETF) to bring the protocol to standard status. Improving Registry Reliability JVTeam will implement co-active data centers and a number of nameserver data centers to create a resilient infrastructure protected against outages through redundancy, fault tolerance, and geographic dispersion. The benefits to the Internet community are improved registry availability and better access to DNS services. Providing Real-Time Responsiveness JVTeam will implement near-real-time updates to the zone files and the Whois database. The benefit to the Internet community is the elimination of delay-caused confusion over domain name registrations. Eliminating Bottlenecks JVTeam's high-availability cluster architecture provides scalable processing throughput, dynamic load balancing between the two data centers, and multiple high-speed Internet connections. The benefit to the Internet registrar community is the elimination of registry bottlenecks. JVTeam's proposed TLD technical solution is based on our experience with the Number Portability Registration Center (NPRC) and with .com.au registry operations. Our technical solution consists of co-active registry data centers and nameserver data centers, geographically dispersed to provide protection against natural and man-made disasters. Section III.2.1 provides an overview of our proposed facilities and systems; subsequent sections expand this overview into a comprehensive technical plan for registry operations. JVTeam proposes world-class redundant Shared Registration System (SRS) Data Centers in Sterling, Virginia and Chicago, Illinois and four nameserver sites in Phase I that will provide the facilities and infrastructure to host the new TLD Registry. Our facility locations were selected to give wide geographic separation and provide resilience against natural and man-made disaster scenarios. The benefit to ICANN and the Internet community is reliable non-stop TLD registry operations. ICANN's priorities for the new TLD registries are to provide a world-class level of services that preserve both the stability of the Internet and the security and reliability of the existing domain name system. JVTeam has developed a fault tolerant architectures including redundant facility implementation, high availability cluster server architectures, fault tolerant database technology, and redundant alternate routed network connectivity supports mission critical service availability now. The Internet community needs to be able to depend on the Internet as a stable, highly available infrastructure for worldwide collaboration and commerce. In the subsection that follows we describe where the JVTeam facilities are located and provide a functional description and physical description of the Shared Registration System (SRS) data center and the nameserver sites. In subsequent subsections we provide a detailed system description of each of the systems residing within these facilities. This section describes JVTeam's proposed TLD Registry architecture consisting of redundant SRS data centers and multiple nameserver sites to provide a seamless, responsive, and reliable registry service to registrars and Internet users. As shown in Exhibit III.2-1 our TLD registry redundant SRS and nameserver data center sites are geographically dispersed worldwide and interconnected with a Virtual Private Network (VPN) to provide worldwide coverage and protect against natural and man-made disasters and other contingencies. The facility locations are provided in the following table. SRS Service Availability is guaranteed at 99.95%, with a design goal of 99.99% per year. High availability registry services can only be provided from facilities that have been designed and built specifically for such a critical operation. The JVTeam SRS data centers incorporate redundant uninterruptible power supplies; high-capacity heating, ventilation, and air conditioning; fire suppression; physical security; C2 level information system security; firewalls with intrusion detection; redundant, high availability cluster technology; and redundant network and telecommunications architectures. When selecting the sites, we considered their inherent resistance to natural and man-made disasters. 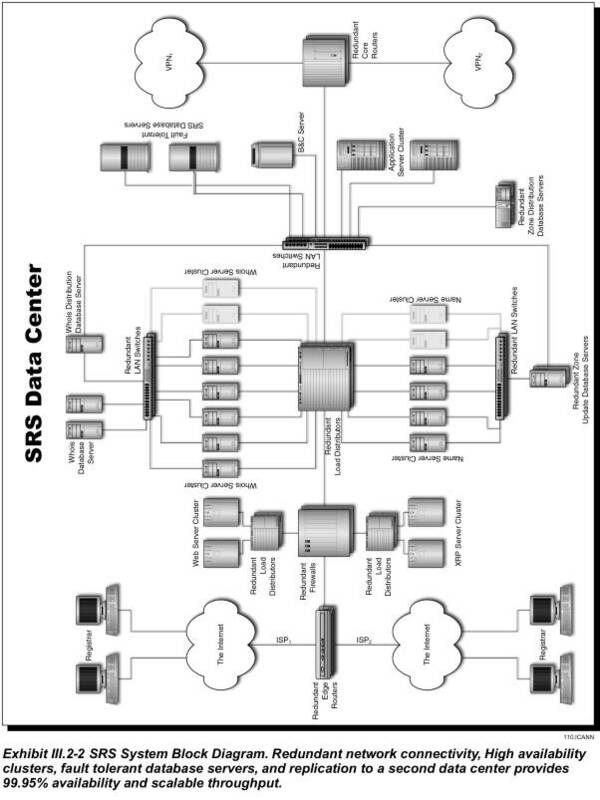 The functional block diagram of our SRS data center is depicted in Exhibit III.2-2. As can be seen from the referenced exhibit the registry SRS data center is highly redundant and designed for no single point of failure. Each SRS data center facility provides the functions listed in the system function directory table below. Descriptions of the SRS systems providing these functions are provided in the next subsection. High capacity Web Servers provide secure web services and information dissemination that is outside the scope of the XRP protocol. It contains a registry home page to enable registrars to sign in and inquire about account status, get downloads and whitepapers, access frequently asked questions, obtain self help support, or submit a trouble ticket to the TLD Registry Help Desk. XRP transactions received from registrars undergo front-end processing by the XRP server that manages the XRP session level dialog, performs session level security processing, and strips out transaction records. These XRP transaction records are sent to the SRS data center application server cluster for security authentication and business logic processing. 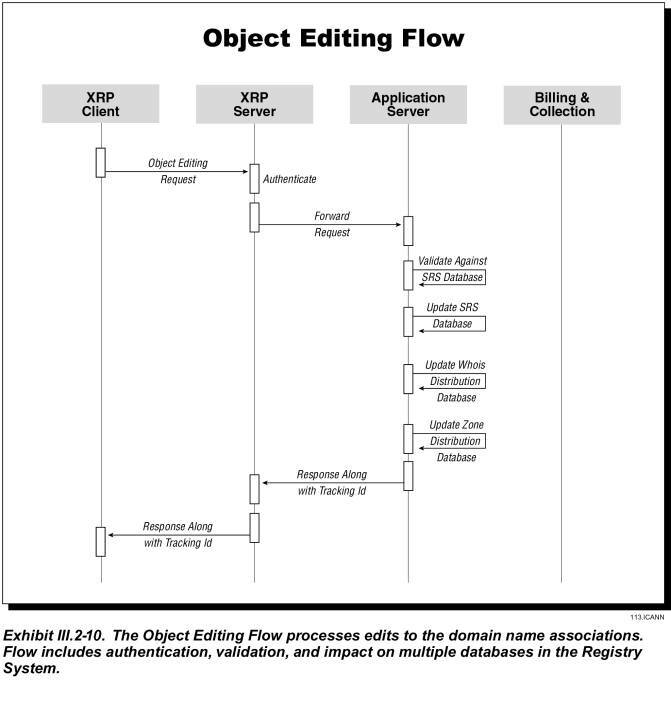 Processing of the XRP applications business logic, user authentication, posting of inserts, deletes, updates to the master database, and interfaces to authentication, billing and collections, backup, and system/network administration. The SRS database maintains registry data in a multi-threaded, multi-session database for building data-driven publish and subscribe event notifications and replication to downstream data marts such as the Whois, Zone, and Billing and Collection services. The Whois Distribution Database is dynamically updated from the SRS database and propagates the information to the Whois Database clusters. The Whois Database is dynamically updated from the Whois Distribution Database and sits behind the Whois Server clusters. The Whois Database clusters are used to lookup records that are not cached by the Whois Servers. The Load Balanced Whois Server Clusters receive a high volume of queries from Registrants and Internet users. The Whois service returns information about Registrars, domain names, nameservers, IP addresses, and the associated contacts. The Zone Distribution Database is dynamically updated from the registry SRS database and propagated to the nameserver sites located worldwide. It contains domain names, their associated nameserver names, and the IP addresses for those nameservers. A commercial off the shelf system is customized for registry specific eCommerce billing and collection functions that are integrated with XRP transaction processing, the master database and a secure web server. The system maintains each registrar's account information by domain name and provides status reports on demand. Authentication Service uses commercial x.509 certificates and is used to authenticate the identity of entities interacting with the SRS. Provides backup and restore of each of the various cluster servers and database servers files and provides a shared robotic tape library facility for central backup and recovery. Provides system administration and simple network management protocol (SNMP) monitoring of the network, LAN-based servers, cluster servers, network components, and key enterprise applications including the XRP, Web, Whois, Zone, Billing and Collections, Backup/Restore, and database application. Provide threshold and fault event notification and collects performance statistics. Provides client/server GUI for configuration of SRS applications including XRP, Web, Billing and Collection, Database, Authentication, Whois, Zone, etc. Protects the building LAN from the insecure Internet via a Firewall that provides policy-based IP filtering and network-based intrusion detection services to protect the system from the Internet hacking and denial of service attacks. Dynamic Feedback Protocol (DFP) based load balancing of TCP/IP traffic in a server cluster including common protocols such as least connections, weighted least connections, round robin, and weighted round robin. Dual-homed access links to Internet Service Providers (ISPs) and Virtual Private Network (VPN) services are used for connectivity to the Internet and the JVTeam Registry Management Network. A single point of contact telephone and Internet-Web help desk provides multi-tier technical support to registrars on technical issues surrounding the SRS. As discussed above, two nameserver sites are co-located at our SRS Data Centers and the remaining two nameservers System sites in Phase I are geographically dispersed with dual homed Internet and VPN local access telecommunications links to provide resilience and disaster recovery. 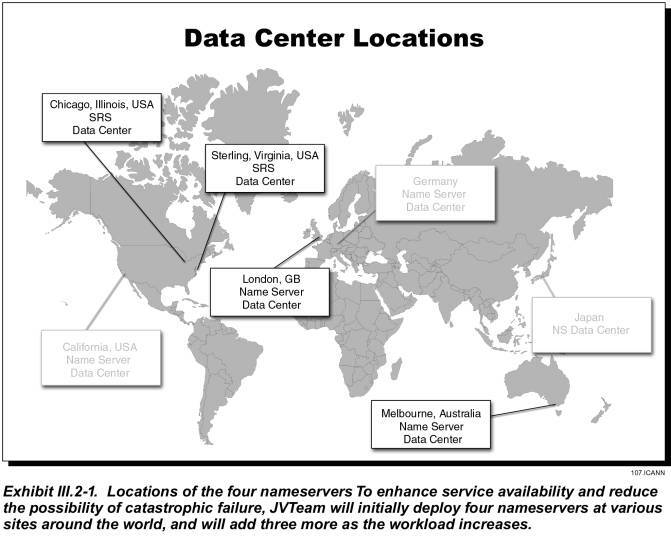 The two additional nameservers sites will be installed in Data Centers in Melbourne, Australia and London, England. In phase II we plan to install additional nameserver data centers in Japan, California and Germany; if required to handle DNS query load. 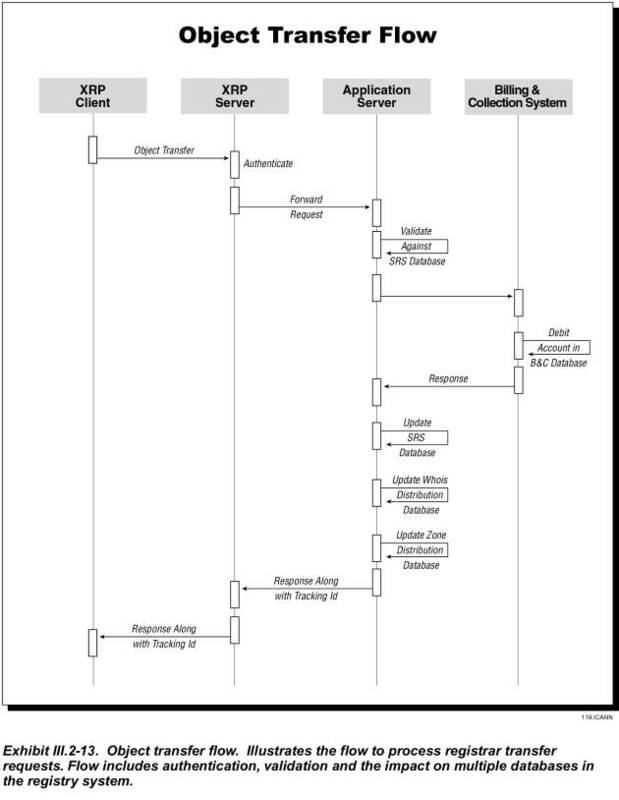 The functional block diagram of our nameserver sites is depicted in Exhibit III.2-3. As can be seen from the exhibit the nameserver sites are configured to be remotely managed and operated lights out . The hardware configuration is highly redundant and designed for no single point of failure. The following function directory table lists the nameserver functions. Descriptions of the systems providing these functions are provided in the next subsection. The SRS Zone Distribution Database is propagated to the Zone Update Database Servers at the nameserver sites located worldwide. Information propagated includes domain names, their associated nameserver names, and the IP addresses for those nameservers. The nameserver handles resolution of TLD domain names to their associated nameserver names and to the IP addresses of those nameservers. The nameservers are dynamically updated from the Zone Update Database. Updates are sent over the VPN Registry Management Network. Each JVTeam data center facility is located in a modern, fire-resistant building that offers inherent structural protection from such natural and man-made disasters as hurricanes, earthquakes, and civil disorder. Sites are not located within a 100-year flood plain. Facilities are protected by a public fire department, and have their internal fire-detection systems connected directly to the fire department. Data centers are protected from fire by the sprinkler systems of the buildings that house them. Furthermore, each equipment room is protected by a pre-action fire-suppression system that uses Inergen gas as an extinguishing agent. The environmental factors at the SRS Data Center and nameserver sites are listed in the following table. Dual redundant HVAC units control temperature and humidity. Either unit will maintain the required environment. All equipment-mounting racks are grounded to the building's system, and are equipped with grounding straps that employees wear whenever they work on the equipment. In addition to providing physical security by protecting buildings with security guards, closed circuit TV surveillance video cameras, and intrusion detection systems, JVTeam vigilantly controls physical access to our facilities. Employees must present badges to gain entrance, and must wear their badges at all times while in the facility. Visitors must sign in to gain entrance. If the purpose of their visit is found to be valid, they are issued a temporary badge; otherwise, they are denied entrance. At all times while they are in the facility, visitors must display their badges and must be escorted by a JVTeam employee. Sign-in books are maintained for a period of one year. On-site security personnel are on duty 24 hours a day, 7 days a week to monitor the images from closed-circuit television cameras placed strategically throughout the facilities. Security personnel are stationed at each building-access point throughout normal working hours; at all other times (6:30pm to 6:30am and all day on weekends and major holidays), individuals must use the proper key cards to gain access to the buildings. Further, any room housing sensitive data or equipment is equipped with a self-closing door that can be opened only by individuals who activate a palm-print reader. Senior facility managers establish the rights of employees to access individual rooms, and ensure that each reader is programmed to pass only those authorized individuals. The palm readers compile and maintain a record of those individuals who enter controlled rooms. Co-active redundant data centers geographically dispersed to provide mission critical serviceavailability due to two-way database replication between the centers. Nameserver sites are designed with full redundancy, automatic load distribution, and remote management for lights out operation. A Virtual Private Network to provide a reliable, secure management network and dual homed connectivity between the data centers and the nameserver sites. Each SRS data center and nameserver site uses high availability cluster technology for flexibility, scalability, and high reliability. Registry systems are sized initially to handle the projected workload but can grow incrementally to accommodate workload beyond the current registry operations. The registry database uses fault tolerant server architecture and is designed for fully redundant operations with synchronous replication between the primary and secondary. JVTeam is proposing moderate-level, mid-level, and high-end cluster server platforms for installation at each site. The servers are selected for applications depending on the requirements, storage capacity, throughput, interoperability, availability, and level of security. These server platform characteristics are summarized in the following table. As previously shown in Exhibit III.2-2 the SRS data centers provide co-active fully redundant system configurations with two-way replication over the high speed VPN Registry Management Network, a co-located complete nameserver, and dual-homed connectivity to the Internet Service Providers. Descriptions of each of the systems in the SRS Data Center site are as follows. 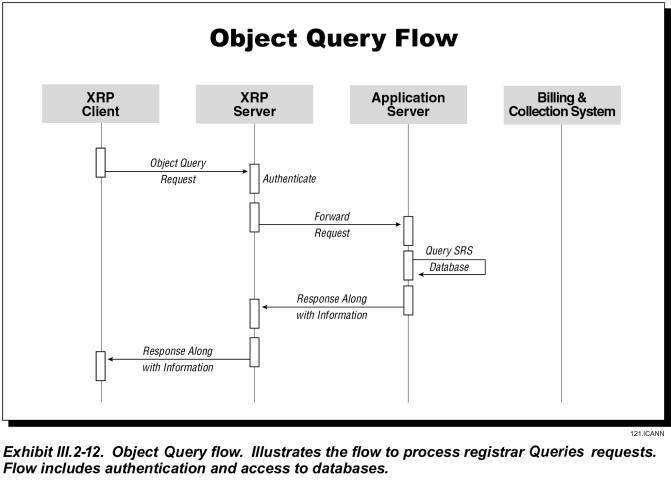 XRP transactions received from registrars over the Internet undergo front-end processing by the XRP Server which manages the XRP session level dialog, performs session level security processing, and strips out the transaction records. These XRP transaction records are sent to the SRS data center application server cluster for security authentication and business logic processing. The XRP server is a mid-level RISC SMP machine with local disk storage. It off-loads the front end processing of the XRP protocol and off-loads the extensive communication protocol processing, session management and SSL security encryption/decryption from the applications servers. 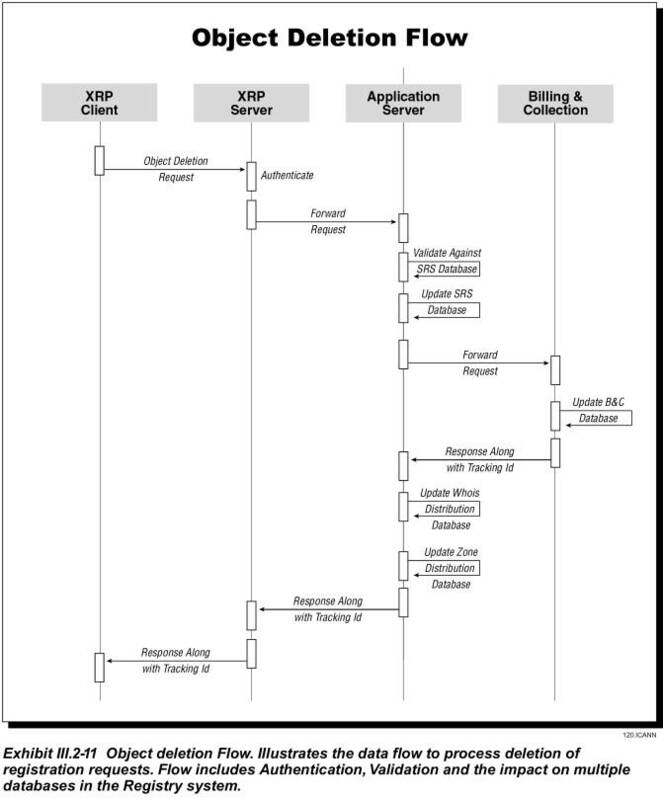 The XRP server strips the fields out of the XML document transaction and builds XRP binary transaction packets that are sent to the application server for initial security authentication and log on with user id and password. Once the user is authenticated, the session is active and the XRP application server performs all business logic processing, billing, collection, and database operations. A complete nameserver for DNS queries is co-located in each SRS data center site. As previously shown in Exhibit III.2-3 the nameserver consists of redundant Internet Service Provider (ISP) and Virtual Private Network (VPN) local access links to provide alternate routed connectivity to Internet users and JVTeam's Registry Management Network. Redundant Internet Firewalls provide policy-based IP filtering to protect our internal building LAN from intruders and hackers. The application server cluster is a high availability multiple computer cluster. Each computer within the cluster is a mid-level processor with its own CPU, RAID disk drives, and dual LAN connections. Processor nodes used in the clusters are RISC symmetric multiprocessor (SMP) architectures scalable in configurations from 2 to 8-way with the processing and storage capacity for very large applications. 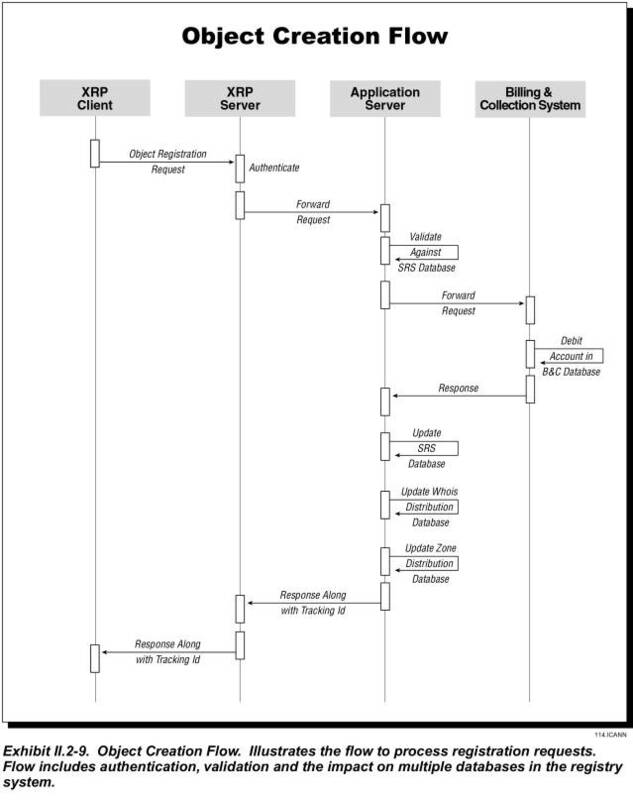 As depicted in Exhibit III.2-4, the application server cluster is designed to handle the registrar transaction workload and provides the business logic processing applications and interfaces to the authentication server, SRS database, and billing and collection system. The application server cluster is front-ended with a TCP/IP load balancer to equitably distribute the processing load across the cluster processors. The cluster manager software monitors hardware and software components, detects failures, and responds by re-allocating resources to support applications processing. The process of detecting a failure and restoring the application service is completely automatic no operator intervention is needed. The database server consists of two identical Fault-tolerant RISC systems that are designed for high volume on-line transaction-processing (OLTP) database applications. Each server contains high-end RISC processors scalable in configurations from 2 to 32-way. A crossbar-based symmetric multiprocessor (SMP) memory subsystem is capable of supporting the up to 32 GB of memory needed to maintain high OLTP transaction workloads. The storage subsystem supports up to 288 GB of internal RAID storage and up to 50 TB of external RAID storage. The database management software is based on a parallel database architecture with a fault tolerant server option capable of maintaining 24 x 7 availability. The Fault-Tolerant Server supports high availability operations by implementing synchronous replication. The database enables transparent database fail-over without any changes to application code or the operating system. Clients connecting to a replicated database are automatically and transparently connected to the replicated pair of databases. The database replication feature enables maintaining geographically separated data services for multiple sites over a WAN to provide disaster recovery. A multi-session, multi-threaded server and dual cache architecture (client/server) provides exceptionally high throughput and fast access to stored objects. A powerful database-driven publish and subscribe event notification system enables applications such as Whois or Zone Distribution to subscribe to a specific SRS database activity, for example, a domain name insert. When the domain name insert occurs, an event is generated by the database to be handled as a dynamic update to the Whois and Zone distribution servers. Certain SRS database events such as a domain name insert, domain name delete, or domain name change, generate a notification to subscriber databases such as the Whois Distribution Database. 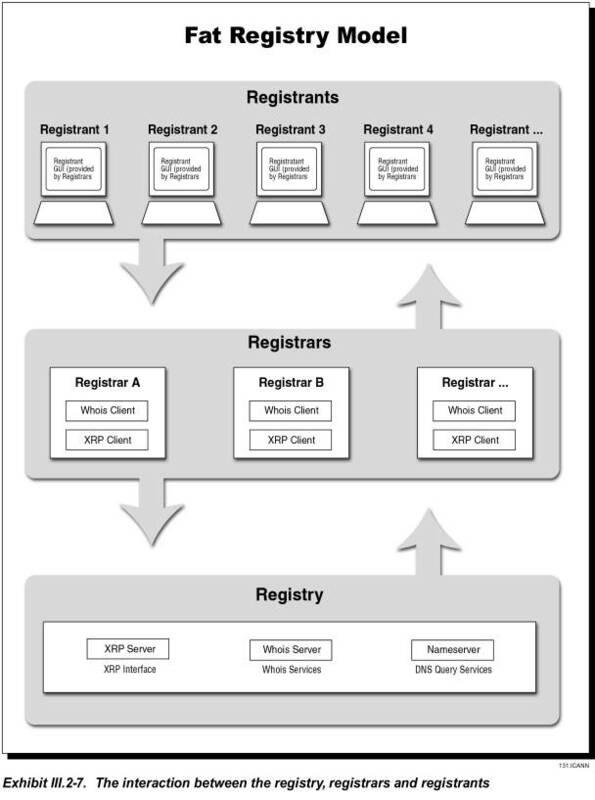 Modifications to the Whois Distribution Database are replicated to the Whois Database Clusters. The Whois architecture gives the flexibility to deploy Whois database to any number of JVTeam Data Centers. In the initial phase the Whois infrastructure will be deployed to the two SRS Data Centers. However in the future, and based on load placed on the initial two Data Centers, additional infrastructure can be deployed to any of the nameserver Data Centers managed by JVTeam. Each Whois Database receives replicated updates from the Whois Distribution Database. The initial Whois Database will consist of two mid-level RISC database servers configured in a high availability cluster with RAID storage and from 2 to 8-way SMP processors. Since data is cached in the Whois Servers, the Whois Database is hit only when a Whois Server has not cached a request in memory. The Whois service is available to anyone and can receive transaction volumes in the order of one billion requests per day. The cluster is a rack mount Intel Pentium-based high availability multiple computer cluster that maintains a separate database for domain name registrations and caches commonly requested records. Processor nodes used in the Whois cluster are moderate-level Intel Pentium SMP machines scalable in configurations from 2 to 6-way SMP with local disk storage. The Whois database contains information about Registrars, Domain names, nameservers, IP Addresses and the contacts associated with them. This is an improvement over the current registry that provides no end-user contact information. The Whois server cluster is front-ended with a load balancer designed to distribute the load equitably to the servers in the cluster and handle extremely high volumes of queries. The load balancer tracks processor availability and maintains high query processing throughput. The Zone Distribution Database is dynamically updated from the SRS database using the same technique used for the Whois Distribution Database. The Zone Distribution Database is propagated to Zone Update Database at the nameserver sites using replication. This approach is far better than the current approach of TLD Zone File updates for .com, .net, and .org that occur two times per day. The Billing and Collection server is a LAN-based mid-level RISC machine in configurations scalable from 2 to 8-way SMP with the processing and storage capacity for very large enterprise applications. This server runs a commercial off the shelf customer relationship management and billing and collection system that interfaces with the SRS database. A high capacity secure Web Server cluster is provided to enable secure web services and information dissemination that is outside the scope of the XRP protocol. It contains a registry home page to enable registrars to sign in and inquire about account status, get downloads and whitepapers, access frequently asked questions, obtain self help support, or submit a trouble ticket to the TLD Registry Help Desk. The Web Server is a mid-level RISC SMP machine with local disk storage. The authentication server is a LAN-based mid-level RISC machine scalable in configurations from 2 to 8-way SMP with local RAID storage. This server runs commercial x.509 certificate based authentication services and is used to authenticate the identity of Registrars and optionally Registrants. In addition, the authentication server supports our secure Web Server portal for Registrar Customer Service functions. The backup server is an Intel Pentium-based SMP server that runs the backup and restore software to backup or restore each of the various cluster servers and database servers and provide a shared robotic tape library facility. It interfaces to the Intel server clusters and RISC server clusters over a high speed Fiber Channel bridge. It interfaces with the high-end fault tolerant database servers via a Disk Array and the Fiber Channel bridge to that interconnects to the robotic tape library. It is capable of performing remote system backup/restore of the nameservers over the VPN-based Registry Management Network. The system/network management console provides simple network management protocol (SNMP) monitoring of the network, LAN-based servers, cluster servers, and key enterprise applications including the XRP, Web, Whois, Zone, Billing and Collections, and database application. The server is a LAN-based moderate-level Intel Pentium-based SMP machine with local RAID disk storage and dual attach LAN interconnections. The redundant switched Gigabit Ethernet building LAN backbone gives unprecedented network availability via redundant Gigabit Ethernet switches. Devices are dual attached to each of the Gigabit switch to provide a redundant LAN architecture. The building LAN is protected from the insecure Internet via a Firewall that provides IP filtering and network-based intrusion detection services to protect the system from the insecure Internet hacking and denial of service attacks. We are using dual-homed high-speed Internet local access telecommunications links to two separate ISP providers These links will be alternately routed to provide resilience against cable faults and loss of local access telecommunications links. Similarly the telecommunications access links to our VPN provider for the Registry management network will be dual homed and alternate routed. The Zone Distribution Database at the SRS Data Center is propagated to the Zone Update Database using replication. Replication takes place over the VPN Registry Management Network. The Zone Update Database is not hit when resolving DNS queries; instead the nameservers update their in-memory database from the Zone Update Database, within defined service levels. The nameserver cluster handles resolution of TLD domain names to their associated nameserver names and to the IP addresses of those nameservers. The resolution service can handle in excess of 1 billion queries per day, and our load-balanced architecture allows additional servers to be added to any nameserver cluster to allow on-demand scalability. 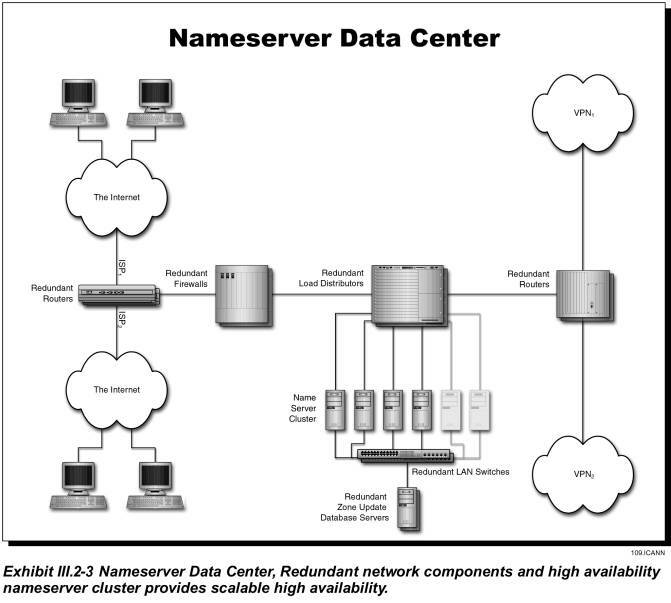 The nameserver Cluster is a high availability rack-mounted multiple computer cluster consisting of moderate-level Intel Pentium-based SMP machines configurable from 2 to 6-way SMP with local disk storage and dual attachment to the LAN. A TCP/IP server load balancer switch is used to distribute the load from Internet users. The server load balancer uses dynamic feedback protocol to enable servers to provide intelligent feedback to the load balancer to ensure that traffic is not routed to over-utilized servers. The load balancer supports algorithms including least connections, weighted least connections, round robin, and weighted round robin. A redundant switched Ethernet building LAN backbone maintains high network availability via redundant Ethernet switches. Devices are dual attached to each of the Ethernet switches to provide a redundant LAN architecture. The building LAN is protected from the insecure Internet via a Firewall that provides IP filtering and network-based intrusion detection services to protect the system from the insecure Internet hacking and denial of service attacks. A summary of the features and benefits of our TLD registry system architecture are provided in the following table. Non-stop database services and throughput scaled to handle all registry operations out of one data center. Maximize the number of Transmission Control Protocol/Internet Protocol (TCP/IP) connections managed by a server farm. Facilitates rapid response to Whois queries. JVTeam is using the Internet to provide connectivity to the Registrars and a Virtual Private Network (VPN) to provide a secure Registry Management Network for communications between the SRS data centers and the nameserver sites. JVTeam estimates the peak Internet bandwidth demand at the SRS data centers to be between 5 and 10MB. We will deploy two 45MB T-3 local access telecommunications links at each of our data centers, enabling each to provide TLD services independently of the other. We will provision 5MBs of capacity on each of the T-3 links. Therefore we will provision 10MB into each nameserver site and have up to 90MB (2 x 45MB) of capacity for growth. This should be sufficient growth for at least two years. Connectivity to each data center will be via redundant routers. For security purposes, the router will be configured to only allow DNS UDP/TCP and BGP4 packets. Each router is connected to a load balancer that distributes the query load among the nameservers in that site's cluster. These links will be alternately routed to provide resilience against cable faults and loss of local access telecommunications links. Similarly the telecommunications access links to our VPN provider for the Registry Management Network will be dual homed and alternate routed. Redundant routers are used for both Internet and VPN access. Nameserver database replication from the Zone Distribution Database to the Zone Update Database at the nameserver sites. Remote System/Network Management/Backup of the nameservers. Planning for the potential growth associated with domain registration and administration requires vision and a flexible design. JVTeam's vision is to successfully conduct leading edge software engineering and product development. JVTeam's proven record of successful development and implementation of large projects benefits ICANN by reducing technical and schedule risk. Proven, mission-critical-grade, third-party software products to complement the JVTeam-built software components. Further information regarding these components is presented in the following sections. XML JVTeam proposes the introduction of a new standard protocol, the eXtensible Registry Protocol (XRP), based on XML. This protocol supports system level communication between the Registrar and the Registry. SSL X.509 Certificates will be used over an encrypted SSL session to authenticate Registrars (in addition to IP based and user id/password security). The protocol adaptor architecture allows JVTeam to support a simple but powerful XML based protocol supporting a comprehensive security policy, while eliminating additional load that would otherwise be placed on the core SRS system. The design of the application server component is modular and flexible to support the requirements and scale to meet demands placed on the system. The application server utilizes a stateless architecture allowing scalability simply by adding additional machines to the tier. The core business logic is built into the application server component. This component manages all back-end resources and performs services such as connection pooling and monitoring. The process engines defined in this section are some of the major functional components of the system. Process engines will be added and configured to meet the functional requirements. Process Manager is used to manage the different processes supported by the application. This includes starting processes in a specific order at initialization time, monitoring the health of executing processes, restarting failed processes and starting new processes to address application load requirements. The process manager mediates processing and information requests from external systems by forwarding requests to the respective process engines. The functionality of the primary process engines are explained in detail in sections III.2.3 and III.2.6. The SRS architecture includes a fault-tolerant database supporting high availability operations by implementing synchronous replication. This enables transparent database fail-over without any changes to application code or the operating system. Clients connecting to a replicated database are automatically and transparently connected to the replicated pair of databases. The architecture utilizes a powerful database-driven publish and subscribe event notification system enabling components such as Whois or Zone Distribution to subscribe to specific SRS events. Subscribed events cause dynamic updates to the Whois and Zone distribution servers. Please refer to section III.2.3 for a detailed description of the Database capabilities. The guiding principles for the design of the proposed Registry Web Interface are flexibility and security. The Registry web interface will be accessible over the Internet, using a client web browser and will be served up by the Registry web server clusters at the SRS Data Centers. The secure web servers provide front-end HTTPS (secure web) protocol handling with client browsers accessible over the Internet. Open, non-proprietary, standards-based technology (HTTP + SSL). Please refer to section III.2.6 for a detailed description of the Billing and Collection system along with the interfaces, security and access privileges. Zone related modifications to the SRS Database cause equivalent changes to the subscribing Zone Distribution Database. Updates to the Zone Distribution Database are replicated out to the Zone Update Databases at each nameserver Data Center. Machines in the nameserver Cluster reconcile their in-memory database with the Zone Update Database at regular intervals defined in the service level agreement. The entire Zone is held memory resident. Section III.2.5 explains nameserver architecture is detail, along with the process, software and advantages. Whois related modifications to the SRS Database cause equivalent changes to the subscribing Whois Distribution Database. Updates to the Distribution Database are replicated to the Whois Database Cluster at each SRS Data Center. Machines in the Whois Server Cluster cache common requests in-memory, taking load off the Whois Database Cluster. Cached items expire after a defined time interval to ensure Whois data can be guaranteed correct within defined service levels. Please refer to section III.2.8 for a detailed description of the Whois capabilities. 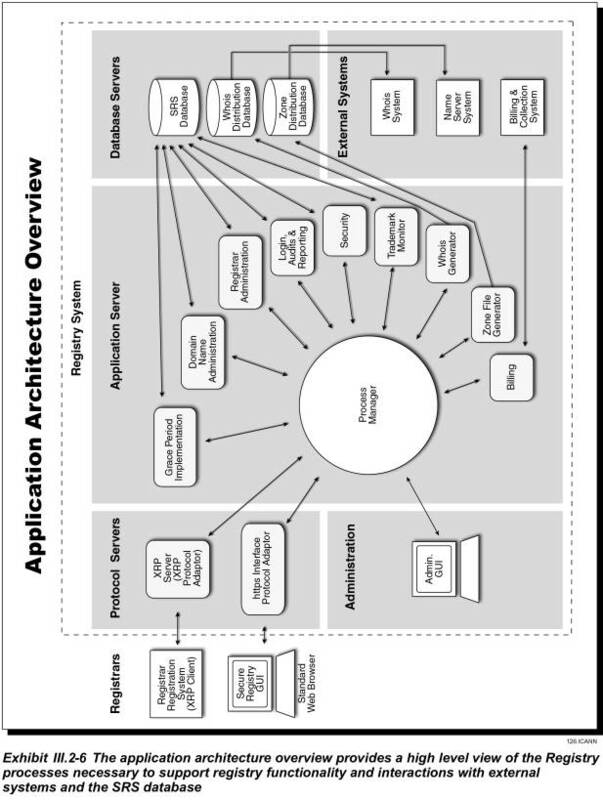 Exhibit III.2-6 provides a more detailed application architecture overview. The quick time to market and software technologies required to design and implement the registry software applications dictate software development methodologies that minimize software development and reduce development time without sacrificing software quality. The JVTeam technical personnel are experts in software applications development of registry and clearing house protocols and software applications used in Internet domain names and phone numbering systems. The benefit to ICANN is software products that meet the functional requirements and operate reliably. Based on our experience, JVTeam is using Rapid Application Development (RAD) methodology and Computer Aided Software Engineering (CASE) tools for registry software applications development. RAD methodology enables large applications systems to be developed and tested incrementally in planned releases consisting of alpha, beta, and full production versions. We have found that incremental development of software applications is a key success factor in fielding feature rich software applications that meet the business needs. This is because each incremental build provides a testable software product that can be demonstrated to users and stakeholders. Changes can be easily incorporated in the next build cycle and each successive build provides increased functionality until the full production release is completed, tested, and accepted. In the RAD methodology there are five phases. 1. Business Analysis Focus group and Joint Application Design sessions are used to document the system requirements, business process flows. business logic, and system data requirements. 2. System Design Software specifications are developed using object oriented analysis and object oriented design CASE tools and logical data models are developed using entity relationship diagram data modeling. Meta data is developed for each data entity. 3. 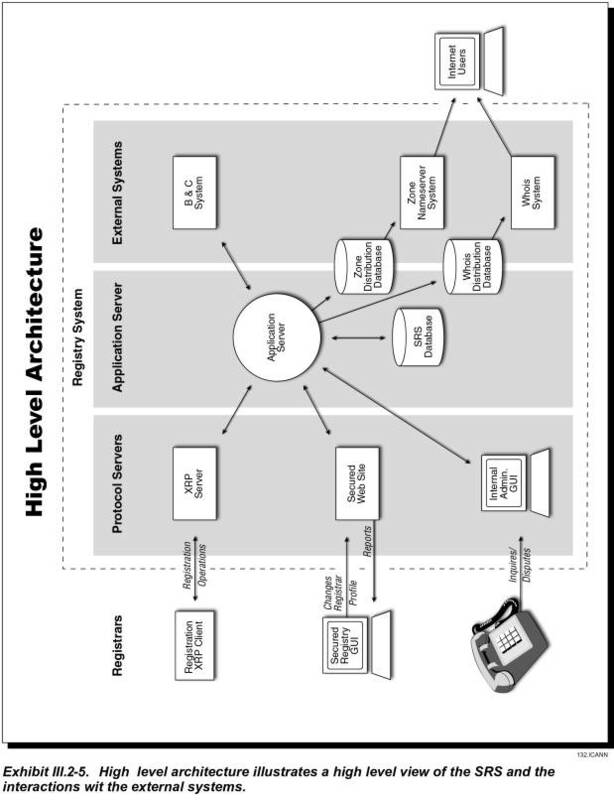 Architecture Design the system hardware and software architecture is designed and documented. Then hardware and software systems specifications and configurations are developed and finalized for acquisition. 4. Implementation the applications software is developed for the target hardware platforms and operating system environment using object oriented programming languages, database development tools, and fourth generation languages. Development test beds are built for software testing. The applications software is built and tested in increments with the functionality growing with each build from alpha to beta and to full production. The system hardware and software is installed in the planned data centers for rollout and acceptance of the applications software production release. The Carnegie Mellon University Software Engineering Institute Software Capability Maturity Model (SW-CMM) best practices are used for project management, requirements management, software configuration control, and software quality assurance. 5. Growth and Maintenance during this phase the applications software is successively upgraded in planned build and release cycles. Software incident reports are addressed in each build and release. Maintenance releases are developed for serious software problems that cannot wait until a planned upgrade release. JVTeam is using object-oriented analysis and object-oriented design CASE tools for requirements analysis and detailed software design. We use object oriented programming, database development tools, and fourth generation programming languages for software development. The following table gives examples of tools JVTeam has used in the past and will use on the Registry project. JVTeam will utilize CASE tools such as Oracle CASE and Rational Rose. These tools provide full feature object oriented analysis and design. JVTeam has prior experience with, and will utilize these development languages where appropriate to implement all business logic. JVTeam has prior experience with, and will utilize these Remote object protocols. JVTeam has prior experience with, and will utilize these web development technologies for building web sites and thin client applications for distribution to a wide range of users. This section describes existing numerous problems with the current Registry-Registrar model and RRP protocol, and provides JVTeam's proposed methods for resolving these problems. The current registry/registrar model and protocol is a thin (limited amount of data) registry serving a fat (more data) registrar. JVTeam proposes moving to a fat registry model, with contact and authentication details stored centrally at the Registry. Under this model, the business relationships would be unchanged: registrants would still deal with the registrar, and the registrars with the registry. The value of the proposed change is its ability to solve many of the problems currently experienced on a daily basis by both Registrants and Registrars. As part of its fat-registry proposal, JVTeam proposes to introduce a new protocol, the eXtensible Registry Protocol (XRP), which will overcome the limitations of the current RRP protocol (RFC2832). The XRP protocol will accommodate both thin and fat registry models. We do not anticipate introducing the XRP protocol until after the land rush period has ended. TLD security sinks lowest common (registrar) denominator, because a registrar with poor security could perform an incorrect Transfer of Registrar, giving the registrant control of the wrong domain name. Potential for hijacked domain names creates huge stability problems to the Internet. As the beginning of this proposal paragraph (III.2.2) states, JVTeam proposes deploying a fat registry model, with contact and authentication details stored centrally at the Registry. Exhibit III.2-7 illustrates the fat registry model. Rollback support (i.e., rollback registrar transfer; not necessarily transactional). JVTeam firmly believes that the industry needs a new extensible protocol that addresses all of the above points, and that the selected protocol should become the industry standard. JVTeam's position is that there is infinite room to innovate in many other aspects of domain-registry systems, but competition at the protocol level merely fragments the domain-name-registration industry. Conversely, the industry will gain significantly in efficiency if it adopts a standard protocol that addresses the listed requirements, particularly in supporting both fat and thin Registry models. JVTeam's proposed XRP protocol addresses each of the above points. We will present a draft XRP to the IETF as the basis for an industry standard in Q4 2000, and will invite comments and suggestions from registrars, registries, and other concerned individuals and organizations. Rather than holding XRP as proprietary, we will undertake all reasonable measures to obtain consensus on making the proposed protocol an open industry standard. JVTeam's proposed XRP Solution and fat-registry model will preserve the current relationships that are familiar to both registrants and registrars. Simultaneously, they will solve the many problems with the current RRP-based model that is raising costs for registrars and distressing registrants. Nonetheless, despite the fat-registry model's obvious advantages, we are willing to consider alternatives. On the one hand it is theoretically possible retain the current thin-registry model and place more stringent technical requirements on registrars (while closely policing compliance). On the other hand, JVTeam believes that a more practical solution the only solution that introduces true stability and domain security into the market is moving to a fat-registry model with a new XML-based protocol that supports the many enhancements previously listed. The XRP protocol indeed, any new protocol must be designed to fix all the problems with the current model and protocol. To facilitate the transit in 2001 for current registrars, JVTeam will provide an open-source version of the registrar toolkit. This enhanced toolkit will simplify the migration efforts of registrars that currently use the RRP toolkit only. JVTeam is well qualified to take a lead position in the process of developing and standardizing the specification for a new protocol. In preparing our proposal for building a modern, extensible protocol, we relied heavily on the extensive prior experience that Melbourne IT brought to JVTeam. Research groups at Melbourne IT have been using XML for more than two years, and have developed two XML-based domain-name-registration interfaces. Further, the company currently has XML-based interfaces in production. The .geo TLD is based on a hierarchy of domain names. The gTLD registry for .geo needs to be able to register branded domain names at all levels of the hierarchy, for which the proposed XRP will be ideal. This would register server35.acme.com against the one-degree cells 3e4n.10e40n.0e0n.geo and 3e5n.10e40n.0e0n.geo and all the ten-minute cells below both of them (a total of 2 * (1 + 36) = 74 registrations); and server9.acme.com against the ten-degree cell 30e20n.90e90n.geo and all the one-degree and 10-minute cells below that (a total of 1 + 100 * (1+36) = 3701 registrations). This transaction would register server10.acme.com against cells *.0e0n.30e20n.90e90.geo, *.0e1n.30e20n.90e90.geo, and *.0e2n.30e20n.90e90.geo, and server11.acme.com against cells *.5e2n.30e20n.90e90.geo, while maintaining the original registration of server9.acme.com against the remaining one-degree cells. JVTeam will provide an enterprise-strength, fault-tolerant database system capable of managing large databases and high transaction-processing loads reliably, with scalable growth to accommodate change. The database system supports asynchronous replication of data between two co-active SRS data centers geographically dispersed. The benefit to the Internet community is reliable, stable operations and scalable transaction-processing throughput to accommodate Internet growth. Scalability unimpaired performance as the number of users, workload volume, or database size increases. 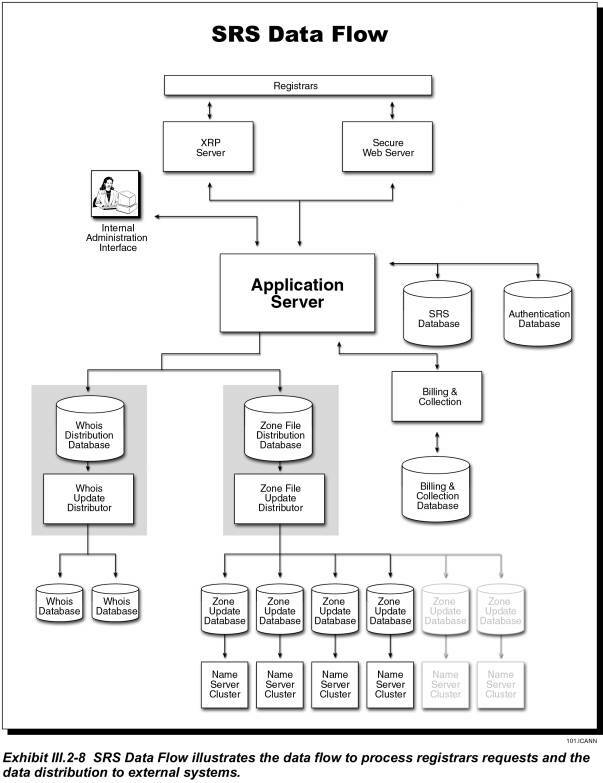 As applications architectures such as SRS become increasingly dependent on distributed client/server communications and processing, system designers must carefully plan where the bulk of the data processing occurs: on the database server, applications server, or client. Our final design will distribute the processing workload in a way that maximizes scalability and minimizes down time. III.2.3.1 Functional Overview describes the characteristics of the three primary SRS databases (i.e., size, throughput, and scalability); database procedures and functions for object creation, editing, and deleting; change notifications; transfer procedures; grace-period functions; and reporting. III.2.3.2 Database System Description describes the database-system components, server platforms, and scalability for the three primary databases. III.2.3.3 Security and Access Privileges describe the access controls for granting and denying users and administrators access to the databases. SRS Database This database's primary function is to provide highly reliable persistent storage for all of the registry information required to provide domain-registration services. The SRS database is highly secured, with access limited to authenticated registrars, trusted application-server processes, and the registry's database administrators. Billing and Collection Database This database will provide the information required for JVTeam to render billing and collection (B&C) services to the registrars. Access to its data is limited to the trusted B&C system processes and to registry database administrators. Registrars can view billing data through a secure Web portal with a B&C Applications Programmer Interface (API). Whois Database The Whois database is a searchable database that any Internet user can access to view details of the domain name stored in the SRS. The Whois database maintains data about registrars, domain names, nameservers, IP addresses, and the associated TLD contacts. The Whois database is updated from the SRS database through an intermediate database and replication process. In addition to these databases, the registry will maintain various internal databases to support various operations, e.g., authorizing login userids and passwords, authenticating digital certificates, and maintaining access-control lists. Replication of databases to achieve high availability and facilitate backup/recovery. The following table lists design parameters for the initial design of the three major databases. The parameters are based on projected volumes in the first two (2) years. Scalability term in the table refers to the database's ultimate capacity expressed as a multiple of the initial design capacity in terms of size and transaction processing power. Trademark Monitor A trademark registration, search, and notification capability. The following paragraphs provide additional information about each of these functions. Exhibit III.2-9 shows how a registrar registers either a new domain name or a nameserver. The registrar's request arrives at the application server via the XRP server. The application server queries the SRS database to determine whether the domain name or nameserver is available. If it is not, the application server notifies the registrar. If valid, the application server queries the Billing database to determine whether sufficient funds are available in the registrars account. If not, the application server notifies the registrar. If funds are adequate, the registrar's account is debited for the appropriate amount and the master database is updated to reflect the registration. The process for registering a nameserver eliminates the billing steps. The application server queries the SRS database to determine whether the nameserver name is available. If it is, the application server updates the server with the new information; if it is not, the application server returns the error code to the registrar. Exhibit III.2-10 shows how a registrar modifies and creates associations for an existing domain name. If valid, the application server updates the SRS database; if not, it returns the error code to the registrar. Exhibit III.2-11 shows how a registrar cancels a domain name or a nameserver registration. If valid, the application server updates the SRS and Billing databases; if not, it returns the error code to the registrar. Exhibit III.2-12 shows how the system handles a query about a domain name, nameserver, or contact identifier. For an Object Information query, the application server returns all information available for the requested object. Exhibit III.2-13 shows how a registrar can transfer a domain name registration from another registrar to himself. The application server queries the SRS database to validate the domain name status. If valid, the application server notifies the losing registrar of the request and initiates the grace period to wait for losing registrar's response. If the losing registrar does not respond within the grace period, or returns a positive acknowledgement, the application server queries the Billing database to determine whether the new registrar's account has sufficient funds for the transaction. If not, the applications server sends the new registrar an error code. If funds are adequate, the registrar's account is debited for the appropriate amount and the master database is updated to reflect the new registrar. It queries the SRS database to validate the status of the domain name. If no longer valid, process terminates. If valid, the application server queries the Billing database to verify that the registrar's account contains sufficient funds. If not, it returns an error message to the registrar. If sufficient funds, registrar's account is charged for one-year renewal and status is updated in SRS database. A registrar's request to renew a domain name arrives at the application server via the XRP server. The application server queries the SRS database to validate the domain name status. If not, it returns an error message to the registrar. If sufficient funds, registrar's account is charged for term of renewal and status is updated in SRS database. Grace period for waiting for losing registrar's response before transferring a domain name registration to a new registrar. Registrar administration refers to adding or deleting registrars, and to providing each registrar with secure access to the system and to that registrar's data. 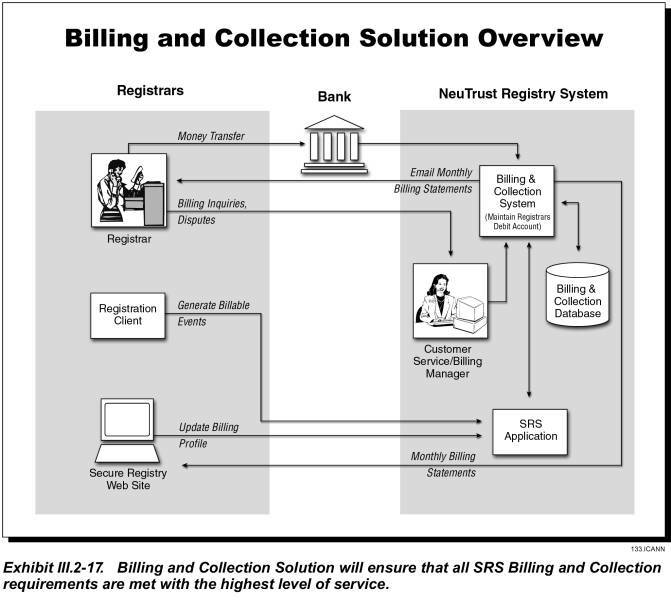 The SRS database manages most registrar data; the Billing database contains the B&C profile and contacts. Any Add/Delete Registrar or Change Registrar Profile request will generate the appropriate changes in the SRS and Billing databases. A typical mass update is a global change of a registrar's name, which may occur when one registrar purchases another. JVTeam will design procedures for mass database changes initiated by registrars or other authorized entities. Trademark holders will be able to submit to their registrars a string of characters that they wish to protect as a trademark. Registrars will submit this string to the registry and request that it be monitored for trademark infringement. The registry will insert the string into a Trademark monitoring file in the SRS database. When the registry receives a Request for domain-name registration that includes the monitored string, it returns a notice that the string is a trademark, provides the contact information for the monitoring trademark holder, and informs the applying registrar of the grace period during which he may revoke the domain-name registration without penalty. The registry then proceeds with registering the domain name. Registrars have the responsibility for alerting registrants if a domain name they have registered contains a sub-string being monitored by a trademark holder. JVTeam's Billing system will monitor the registrars' accounts for insufficient funds. If it determines that the balance is below the required minimum, it notifies the registrar and the registry's customer-service personnel. Detailed list of all fee-incurring charges; e.g., new registrations, registration renewals, registrar transfers. Online Billing Reports The system will generate a variety of reports for internal and external users. Using the Internet, registrars will be able to access their account statements and detailed transaction reports, but not those of other registrars. Registrars will be able to request custom reports. The system will generate these reports in a batch process, and will store them in the FTP directory for the requesting registrar to download. Process large volumes of transactions from users. JVTeam forecasts that, as with most OLTP applications, the anticipated volume of SRS transactions will have a high ratio of reads to writes. We will design the databases and applications by partitioning the workload to improve response times and scalability. The SRS database will support and provide information for primary domain-registration services. The following table lists the data stored in the SRS database. JVTeam will configure the database system to provide appropriate response times for the transactions that registrars perform. We will do capacity planning to ensure that as business requirements increase and demand for domain names grows, the system will be able to handle the workload within agreed response times. Event-management software for remote management. The SRS database server will use the Unix 64-bit operating system with C-2 Controlled-Access security. JVTeam will have vendor-support agreements to keep the systems running and to repair or replace components immediately should problems occur. CPUs To handle increasing volumes of registrar requests, the database platform will scale up to 32 processors. Catalog Pricing information for different transactions; queried in charging process. The database server's operating system will be Unix 64-bit, with C-2 Controlled Access security. CPUs To handle increasing volumes of registrar requests, the database platform will scale up to 6 processors. End-user contact information associated with the domain name. The database server will use the Unix 64-bit operating system with C-2 Controlled Access security. Physical Size The database and database platform can have their storage capacity extended and system configured online with minimum downtime. The database platform will have ability to scale up to 72 GB capacity, and external storage capacity to 71 TB. Memory As the volume of users increases, so does the need for increased buffer and lock-pool storage. The database platform will scale up to 32 GB, sufficient memory to support the system capacity. Proposal Paragraphs III.2.7 (Data Escrow and Backup) and III.2.13 (System Recovery Procedures) describe our proven backup/restore processes, which we will employ for the SRS operation. Backup frequency and logging processes will minimize data loss in case of system outage. Each SRS database component will asynchronously replicate its database in the other co-active SRS Data Center. As Proposal Paragraphs III.2.7 (Data Escrow and Backup) and III.2.13 (System Recovery Procedures) explain, in the unlikely event of a catastrophic outage at one data center, the SRS operations will fail-over to the replicate database. JVTeam will establish security policies and routine logging/auditing/monitoring functions to ensure there is no unauthorized access. We will periodically review security to ensure that the system is functioning as needed. Registrar access to the database is via trusted processes on both the application server, and the Billing server. JVTeam proposes generating zone files in near-real-time, a major improvement that will eliminate some serious deficiencies in the current TLD system. The zone file is a flat database file consisting of the technical information that the DNS requires to function correctly: the domain name, name-server host name, and IP address. Zone file generation is the term traditionally used to describe the process of generating a zone file from the registry database, deploying it to the primary root server, and then propagating it out to the secondary servers. JVTeam proposes a radical improvement to zone file generation and propagation; i.e., updating the zone file data in near real time within defined service levels. Unlike the current system, however, JVTeam's model does not periodically generate a zone file and then publish the new file to a set of nameservers. This Proposal describes our process for creating updates for the nameserver files; Section D15.2.5 contains information about distributing and publishing the updates. To make the two sections complete and self-sufficient, each contains certain information that is also found in the other. Zone file update (and propagation) is a batch process performed twice a day. ― Because updates occur infrequently, registrants have an additional delay before their domain names become live. This delay confuses the registrants, who believe that a problem exists and contact the registrar. The registrars must, in turn, respond by deploying unnecessary customer-support resources. ― Currently, web sites can easily go down when a registrant transfers a domain name to a new hosting provider. This occurs when, because of the current delay in zone file generation, the original hosting provider removes the web site before the DNS is updated with the new delegation information. This adversely affects the general stability of the Internet. Zone file information does not match Whois information because the two files are often updated at different times. ― Currently, registrants can update zone information, and then check the Whois server to verify it. Because the zone file and Whois service are not synchronized, the registrants become confused. As with delayed zone file updates, this information mismatch causes additional and unnecessary customer-support demands on registrars. They eliminate the synchronization problems that now occur when information is modified. They enable us to define and monitor service levels for the maximum allowable time between zone file updates. Registrars are solely responsible for creating, modifying, and deleting information that updated the zone file. The XRP protocol is the only gateway available to registrars for zone file editing. This protocol is accessed using the JVTeam XRP servers. A registrar gains access to a domain name (and associated nameserver) when he registers that domain name or when the appropriate Transfer of Registrar is enacted. In the case of a Transfer of Registrar, access control is revoked from the losing registrar after the transfer. Access control to zone file data for XRP Delete/Modify Domain Name commands is granted only to the registrar that has management rights over the domain name. In the case of an XRP Create/Modify/Delete Nameserver command, access control is granted only to the registrar that has management rights over the nameserver's parent domain name (i.e., ns1.icann.org has a parent domain name icann.org). Section III.2.5 contains information about deployment security. Section III.2.9 contains information about other security issues, including system and network security and access-control authentication and authorization. JVTeam will generate zone file updates (diffs) at regular intervals within defined service levels. Our solution enables us to meet any reasonable service level merely by adding incremental hardware items and reconfiguring system software settings. The load on the core registration system has fallen below 70 percent. Bind subscribers to limiting conditions as to how they can use the data. Provide the entire database in a consistent format that will facilitate such services as suggesting alternate names, accelerating DNS queries, and compiling industry statistics. All zone files and updates are generated using information from the SRS database. All updates are recorded as database transaction logs. Proposal Sections III.2.7, III.2.12 and III.2.13 contain information about the primary database backup and escrow systems, data center replication and data recovery procedures. 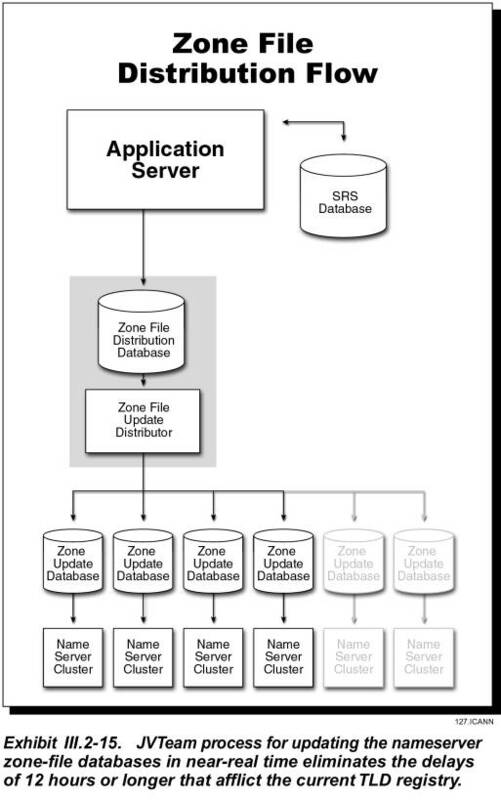 Zone file information is stored in the SRS database (along with all other registry data) and replicated to a zone distribution server within defined service levels. The database stored on the zone distribution server is in turn replicated out to a database at the nameserver data centers. Greater than a pre-established maximum number of modifications since the last update for a special set of domain names used by key e-commerce sites. The alert threshold will be much lower for these domain names than for the previous check. Each nameserver will run software that correctly implements the IETF standards for the DNS (RFC1035, RFC2181). JVTeam expects to implement all applicable best-practice recommendations contained in RFC2870 (Root Nameserver Operational Requirements). JVTeam proposes a radical improvement in zone file generation and distribution: near-real-time updates of the zone file data. This proposal section (III.2.5) describes the process of updating zone file information at the various nameserver data centers using information from the zone distribution servers at the two co-active SRS data centers. The preceding proposal section (III.2.4) describes how the databases on those zone distribution servers are updated. To make the two sections complete and self-sufficient, each contains certain information that is also found in the other. The databases on the zone distribution servers will be constantly replicated over a Virtual Private Network (VPN) to the zone update database at each nameserver data center. Each nameserver data center will, in turn, use its zone update database to update its zone file databases. Updating will comply with defined service levels. To ensure availability and provide scalability and redundancy, each nameserver data center will have a cluster of two or more nameservers behind a load balancer. This configuration enables JVTeam to rapidly accommodate increases in query load by simply adding servers to the cluster at the affected nameserver data centers. ― Because the system is not real-time, registrants experience a delay before their domain names become live. This delay confuses the registrants, who believe that a problem exists and contact the registrar. In response, the registrars must maintain unnecessary customer-support resources. Zone file information does not match Whois information because the two files are often updated at different times. Currently, registrants can update zone information, and then check the Whois server to verify it. Because the zone file and Whois service are not synchronized, the registrants become confused. As with delayed zone file updates, this information mismatch causes additional and unnecessary customer-support demands on Registrars. Zone file information on secondary servers does not match that on primary servers because of update delays. They facilitate the deployment of innovative new technologies, such as dynamic update, because JVTeam will have technical control of the nameservers. Exhibit III.2-1 (shown previously) provides the locations of the four nameservers that JVTeam will deploy initially, plus the locations of the additional three servers that we plan to add to respond to the anticipated workload increase. We will monitor network utilization and geographic traffic flows and will deploy new nameservers in additional geographic locations when appropriate. At the nameserver data centers, a zone update database constantly receives replication update packages from the zone distribution database server at the SRS data centers. This zone update database is not hit' when the nameservers process requests; the nameservers use it only to update their zone file databases. As DNS software, JVTeam will deploy the latest stable version of BIND, expected to be BIND 9 [http://www.isc.org/products/BIND]. The DNS software will comply with the latest IETF standards [RFC1035, RFC2181]. As we introduced in Proposal Paragraph III.2.4, JVTeam proposes near-real-time update of the zone file data, a radical improvement to zone file generation and propagation. That paragraph discusses how the zone file information is stored in the SRS master database, then replicated to a zone distribution server database. Exhibit III.2-15 illustrates the zone file distribution process. The database on the zone distribution server at the SRS data center is constantly replicated over our VPN to the zone update database at each nameserver data center. The update packages are compressed, encrypted, and sent with an appended checksum. Every update package includes a checksum key, which is a generated checksum of the entire database up to and including modifications in that package. Each time a package updates a nameserver, the checksum is compared to the final state of the zone file data to ensure that the nameserver zone file corresponds to the zone file in the SRS data center's database. If the checksums indicate an error, the nameserver asks the SRS data center to replicate a full zone file to the nameserver. The update package replication process means that the full zone file should never need to be redeployed; however, JVTeam will provide this capability to recover from an unforeseen event. Should this capability be needed, propagating zone file updates may result in a 60-minute delay. We will include this as an exception in the service-level agreements. Exhibit III.2-16 depicts how each nameserver updates its zone file databases from its zone update database within defined service levels. Any technical solution that includes real-time DNS updates must recognize that the most important function of the nameservers is responding to DNS queries. This requirement outweighs real-time updating of the zone file. JVTeam's solution is based on this reality. Although our real-time update process includes establishing and monitoring key parameters that measure compliance with agreed service levels, this process is subordinate to resolving DNS requests. Within this limitation, we are confident in recommending that no more than 10 minutes elapse before processing an update package. Within that 10-minute interval, we will process the update onto a particular nameserver if its workload has fallen below 80 percent of design load. We will negotiate these or other Service-Level Agreements (SLAs) to meet performance requirements in a way that safeguards the integrity of the Internet under heavy DNS load. Our central network management system will log all modifications to the SRS database, all zone file-update actions, and all attempts at intrusion or other security-related events. JVTeam's proven experience in successfully selecting, implementing, and operating complex Billing and Collection (B&C) systems for communications and domain-name registries and registrar services ensures our registry operator's Billing services will be feature rich, accurate, secure, and accessible to the Registrars. The B&C system will maintain customers' accounts, create account statements, audit and tracking information for both customers and the industry. The fundamental goal of the system is to maintain the B&C data and create reports which are accurate, accessible, secured, and scalable. B&C will enable detailed transaction-based charging to the customers, based on extensive resource accounting and usage data recording performed in the Registry System. The B&C system must produce timely and accurate account statements and billing reports that are accurate, easy to understand and contain only clearly defined charges form the Catalog of services and prices. Such account statements are ultimately more economical because they are less likely to provoke costly billing disputes. JVTeam offers a simple B&C process as depicted in Exhibit III.2-17 is based on debit accounts established by each of our registrar clients. We will withdraw all domain registration service payments from the incurring registrar's debit account on a per-transaction basis. We will provide fee-incurring services (e.g., domain registrations, registrar transfers, domain renewals) for a registrar only so long as that registrar's account shows a positive balance. Although our system will operate in US dollars, it will be capable of supporting multiple currency conversions. Further, the B&C system will be sufficiently flexible to adapt to different billable events, grace-period implementations, and pricing structures. Enabling registrars to view their accounts. - Tracking and reporting historical information. Be operational within the scheduled implementation dates. Support multiple Top Level Domain names at varying prices. In the case, the customer, contact, account, service catalog, and all other information will be totally separated between the multiple entities in the database. Exhibit III.2-18 illustrates the major components of the B&C system and its interfaces with other SRS subsystems. B&C database This database, which is separate from the Registry's SRS database, contains the data shown in the following table. Proposal Paragraph III.2.3 discusses the capabilities, management, administration and backup of all databases, including the B&C database. This subsection discusses only the design aspects of the B&C database. B&C Processor The component that processes all domain registration related requests and other billable events from external servers. Monitor and Notifier This component monitors the registrars' accounts for sufficient funds and monitors domain name expirations and renewals. When it detects actionable items, it notifies the transaction processor and the registry's Customer Service organization. Report Generator This component will generate monthly account statements and various reports, including annual reports. This is also the component that Customer Service will use to generate custom reports requested by a registrar. After generating custom reports in a batch process, the report generator sends them to the FTP directory, where they are stored for the registrar to download. Administering a registrar's billing profile. Generating routine and special reports. Transaction Log Files are automatically created by and transferred from external systems such as the application server and database systems. Registrar administration The B&C system will manage the B&C profile for registrars, along with the account and contact information. Transactional services Actions that trigger a B&C event. Registrar's requests result in transactions at the application level and events in the B&C process. Non-transactional services actions including balance forecasting, account balances. The following tables provide details of each type of process flow. Where they state that the B&C system sends a special notification to a registrar, it also sends a copy to the Registry's Customer Service organization. Registry receives the registrar's Registry Service Agreement and the license fee. Registry establishes an account in the B&C system, enters all contact information, but account status is non-operational. Registry verifies registrar's acceptability and invoices for the annual maintenance fee. Registry receives maintenance fee payment and changes account status to operational. Registry notifies registrar to prepay the established debit account. Registry receives registrar's payment, opens debit account, and credits received amount to that account. If registry approves, it updates registrar's B&C profile in B&C system. If registry approves, B&C system extends the credit. If registry approves request, B&C system records the change. B&C system computes the fee; i.e., the annual fee times the requested term (years). B&C system checks the requesting registrar's debit account to verify that balance exceeds fee. If balance is adequate, B&C system withdraws required transaction fee from the account; if inadequate, notifies registrar. B&C system updates B&C database. B&C system notifies registrar of transaction completion. Registrar submits Cancel Domain request to cancel a domain registration. B&C system verifies time of request was within (5-day) grace period. If grace period not exceeded, B&C system credits customer's debit account with the total transaction fee. Registrar submits Renew Domain request to renew a domain for a specified number of years. B&C system computes the fee, which equals the annual fee times requested term. B&C system checks requesting registrar's debit account balance to verify that it exceeds required fee. If balance is adequate, B&C system withdraws fee from account; if not, notifies registrar. B&C system notifies registrar about the renewal. Domain-name registration expires without registrar requesting either renewal or cancellation. B&C system automatically renews domain for one year and computes appropriate transaction fee. B&C system checks registrar's debit account balance to verify that it exceeds required fee. If funds are available, B&C system withdraws fee from account; if not, notifies registrar. Registrar submits Cancel Automatic Renew request. B&C system verifies if request is within (45-day) grace period. If within grace period, B&C system credits registrar's account with the total transaction fee. Registrar submits request to transfer domain to him. Customer Service confirms transfer with registrar relinquishing domain. B&C system checks receiving registrar's debit account to determine whether balance exceeds one-year registration fee. If account balance is sufficient, B&C system withdraws fee; if not, notifies registrar. B&C system notifies registrar that transfer is complete. Special transaction; registry's Customer Service establishes pricing and schedule and inputs data to B&C system. Customer Service establishes fee and generates report(s). Customer Service debits registrar's account for agreed fee. Customer Service transfers report to FTP server for the registrar to download. Trademark holders will register their trademark. B&C system withdraws registrar's annual maintenance fee from his debit account on annual membership anniversary. B&C system notifies the registrar. If the funds in a registrar's debit account fall below the established limit, the B&C system emails a Low Account Balance notification to the registrar. If the fee for performing a requested transaction exceeds the amount in the Registrar's debit account, the transaction is not processed; instead, the B&C system emails an Insufficient Funds notification to the registrar. The B&C system continually calculates the rate of fund depletion from each registrar's debit account over the preceding 30 days. Using this rate, the B&C system calculates the anticipated date when each registrar's account will be depleted. If the anticipated insufficient funds date is less than 21 days hence, B&C system emails a notification to the registrar. Upon receipt of additional funds from a registrar, the B&C system will credit them to that registrar's account. The B&C system will prepare a detailed monthly transaction statement for each registrar and will email it to that registrar. Proposal Paragraph 15.2.3 describes these statements in the subsection titled Reporting Capabilities. The B&C system will compile various B&C-related reports and provide them to registrars and other appropriate parties over the Internet. Network-level Security The primary network-level communications technology underlying the B&C system is the IP protocol. The only interfaces that have access to the B&C system are the Secure Web GUI to monitor account status and the FTP server to download reports. A firewall forms the secure interface between our secure internal network and the untrusted Internet. Firewalls use filters to permit or deny packet flow on the basis of the origin and/or destination of the packet's addresses and ports. Users who want to obtain access to the Secure Web portal that we provide to the registrars must first obtain access to the Secure Web server within the SRS. When the user's Web browser attempts to establish an HTTPS (secure web application protocol) session with the registry, our system initiates the SSL (secure sockets layer). Part of the initialization sequence is a public key exchange or identification. Once the SSL initialization is complete, it establishes a secure, encrypted channel between the user's web browser and the registry's web server, and exchanges digital certificates to ensure the integrity and authenticity of the session. The use of a secure web browser/server ensures that no clear text, including passwords, is sent over the public or shared-data network. System-level Security Secure user login facilities ensure that Secure Web Server users are fully authorized and authenticated. The SRS Secure Web Server presents a login menu on the user's Web browser. The login menu includes 20 lines of warning message stating that this is a private computer system and authorization is required for access. The default warning message will be: NOTICE: This is a private computer system. Unauthorized access or use may lead to prosecution! When users attempt to log into the Secure Web server, they must enter their user-id and their password. The login/password information forwarded back to the JVTeam's Registry web server is encrypted through the secure SSL channel previously established. User-level Security Every B&C system user (individual and application, external and internal) has a unique user login account on the system, with unique user-identification codes (userids) and passwords to authenticate the user and an access control list to control his access to system resources and applications. User profiles are set up and maintained in the database system so that users access to the B&C system is controlled by their user profile and the access privileges granted therein. JVTeam will establish and maintain well-defined security procedures for adding and deleting users and modifying their logon account, access control lists, and user profile access privileges depending on the user's functional role. The following subsection, Access Privileges, contains additional information about user roles and privileges. The following subparagraphs discuss the access privileges of each group. Only internal registry staff members, using cardkeys, can gain access to the registry facility. Registry employees who are authorized to access the B&C system do so using workstations connected through the registry LAN. Except for the system administrators, these employees access the system using the B&C client interface, which will be established specifically for staff members to perform billing adjustments, maintenance, and related functions. System Administrators: perform system upgrades, maintenance, and user administration. B&C System Administrator: configure the B&C system; e.g., user groups and their access rights, batch-process schedule, configurable business rules, etc. B&C System Operator: establish users, monitor back processes, provide system support, and monitor and correct billing errors. Customer Service: view a registrar's billing history and collect information for the B&C manager. B&C Clerks: create transactions, such as invoices and collections, but not make adjustments. B&C Manager: create adjustments, catalog changes, and customer changes. B&C Database Administrator: perform mass database updates. Registrars have only view access to their B&C account status, account statements, and reports. They have to contact B&C personnel within the registry's Customer Support organization for any billing adjustments, custom reports, or special arrangements. Detail transaction report for defined period. Registrars can submit non-standard queries or requests for special reports by contacting JVTeam's Customer Service organization via email, phone, or fax. Customer Service will place any custom reports on a secure FTP server, from which the requesting registrar can download them. Adjustments For billing issues or adjustments in profile or account statements, registrars must contact JVTeam's Customer Service organization via email, phone call or fax. The B&C Manager has the capability of performing any billing adjustments or similar services requested by a registrar. Notifications & Statements The registry will email to each registrar a detailed monthly transaction statement, an account summary, and a detailed list of all fee-incurring charges. In addition, the B&C system will automatically email Low Account Balance and Insufficient funds notifications to any registrar when needed. Backup to DLT Tapes will be performed daily and the tapes are stored in a secure off-site location. Periodic archives of history files and data, which we will also store offsite in a secure location. If the B&C system fails (i.e., the API interface to the application returns an Error status ), a built-in recovery mechanism will ensure against loss of transactions and data, as follows: the application server will log all undeliverable B&C transactions, with transaction identifiers, to an internal file. After the problem is corrected, the file will be transferred to the B&C system for processing. JVTeam will provide the infrastructure to collect all data needed for accounting and auditing reports that meet commercially accepted standards, and will provide this data to ICANN designated auditors. Data will be available for the current fiscal year and for an agreed number of preceding years. JVTeam will assist ICANN auditors by providing all required statements and reports. Annually, JVTeam's internal auditors will audit the registry's B&C system, records, and supporting documentation to verify the accuracy of billing for registry services.